The combination of flotation and metallurgical processing to treat copper anode slime produces approximately 1400 tons of flotation tailings every year in Yunnan Province. These tailings contain a large amount of valuable metals. 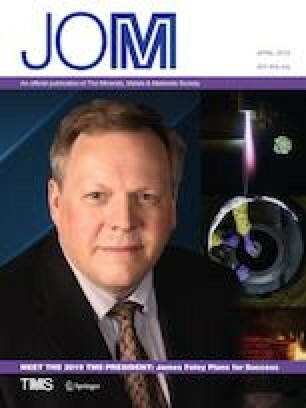 In this article, a vacuum distillation three-stage condensation process is proposed to efficiently and selectively separate valuable metals. A laboratory-scale experiment was carried out under the conditions of 1273 K, 120 min and 0.1–5 Pa. The precious metals silver (95.4%) and gold (96.9%) were recovered in the residue; the base metals lead (99.7%), antimony (95.8%) and bismuth (99.8%) were removed and mainly concentrated in the first volatile phases; the rare metals selenium (90.9%) and tellurium (92.2%) were enriched in the second volatile phase. No waste was produced. This method represents a new technology for the treatment of flotation tailings and provides guidance for industrialization by vacuum distillation. This work was funded by the National Key Research and Development Program of China (2016YFC0400404); by the Program for Nonferrous Metals Vacuum Metallurgy Innovation Team of the Ministry of Science and Technology (2014RA4018); by State Key Laboratory of Complex Nonferrous Metal Resources Clean Utilization, Kunming University of Science and Technology (CNMRCUTS1605); by the Science and Technology Planning Project of Yunnan Province (2017FB082); and by the Basic Research Key Project of Yunnan Province.